Miss L's parents were thrilled at the news that they were expecting a baby girl. However, they knew that life would not be easy for their new baby. Living high in the mountain rangers above Calapan City on Mindoro Island in the Philippines, poverty was a way of life for the Manyan tribe. Very little was available in the way of education for the children and the nearest rudimentary medical care was a two hour trip down the mountain in a motorised tricycle. To add the stress the People Liberation Arm (PLA), and insurgency group fighting to over throw the government constantly harasses the villagers. So when little Miss L was born with a clubbed foot the parents were distraught. Even if there were medical care available there would be no money to pay for the treatment, so they resigned themselves to raising a daughter who would live her life as a virtual cripple. That was until Pauline Curtis-Smith, Ruel Foundations Philippines Director, braved the long swing bridge over a raging river to reach the isolated village and offer some hope to this little family. With her parents permission, Pauline swept Miss L up in her arms and made her way back down the mountain to Calapan City. Miss L remained at our Children crisis centre in the city for months at a time as numerous journeys were made to Manila for consultations with various specialists. 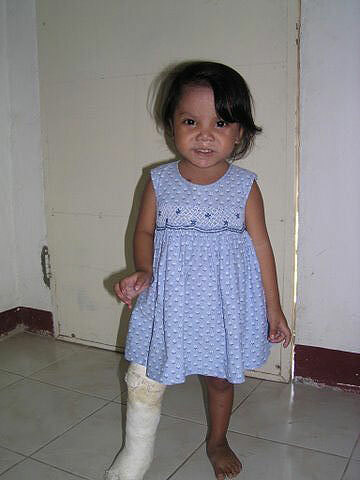 Each trip would take at least six hours to reach Manila by ferry and bus and then there would be several days in the city to attend medical appointments for Miss L . Finally, it was decided not to pursue the option of surgery but rather corrective boots, which was of course a lot less invasive. 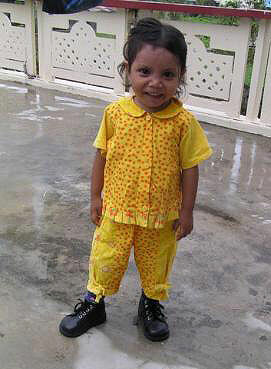 Miss L was thrilled with her new boots and worn them proudly around the crisis centre to show to all her friends. Thanks to our Ruel Foundation staff and our Donors, Miss L is now back with her tribe and attending school. Miss L is just one of hundreds of children from poor and isolated communities who’s lives have been changed by the Ruel Foundation.